Seborrheic dermatitis is one of the most common skin problems seen today. 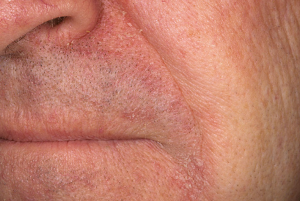 Classically, the rash is located around the ears, eyebrows and nose with a greasy white or yellowish scale. There may be a reddish rash associated but this is not always present. Many people think this condition is from dirty skin but it is not caused by poor hygiene. While the cause is not completely understood, your skin’s barrier function definitely plays an important role. Furthermore, your immune system reactivity to the microbes that normally live on your skin is another key component. When infants acquire this condition, it is called cradle cap. The scaling during infancy can be thick and crusted and will usually resolve in a few months. As adults, the flares often come and go with weather changes and stress. However, severe seborrhea may be associated with underlying systemic conditions so a consultation is advised. Treatment may be with emollients, antifungals, corticosteroids or a combination depending upon your presentation. Furthermore, the medication vehicle is carefully selected (such as a lotion, cream, solution, etcetera) based on the location and severity of your condition to ensure an optimal treatment regimen. If you think you may be experiencing this skin condition or any other rash, please contact us to schedule your appointment.